In the fourth canto, Dante and Virgil have moved past the waystation (portrayed in Virgil's Lead), past the first circle of Hell (Limbo). Before proceeding to the second circle (Lust), they must go before Minos, the judge of all souls that enter Hell. Minos doesn't make an appearance in the map, at least in any form I'm familiar with. It's all good, though. 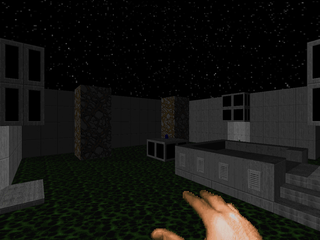 Minos' Judgement is a MAP05 replacement very much in the style of Anderson's other works. It's predominantly a mixture of light brown brick, dark brown, and some marble to help kick things off, with a sewer section in a MAP02 theme rounding out the ending. The map is a fair bit larger than Virgil's Lead, the preceding level, with more than two and a half as many monsters to help fill it out. You can easily divide it into five major sections, with some intermediary rooms that make movement between the locations a bit more fluid. 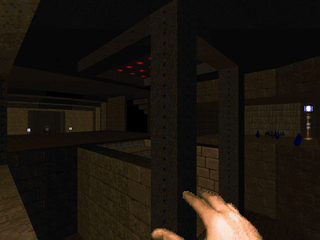 The marble area begins the map and has a nice opening gunfight while gleefully throwing you into a surprising trap near the beginning. It's not that stunning but it helps set things up. This drags you into a high-ceiling indoor room that has some potentially deadly crossfire, with an upper series of rooms loaded with tricks and traps in cramped corridors. You get your first taste of the sewer section afterward in what is an oddly featureless reservoir of nukage housing the blue key. This grants access to the southwestern area, architecturally quite lovely with the southern staircase standing out with its lighting. Anderson plays it a little tricksy here, with two traps you should see coming, and then sends you back to the northeastern area. 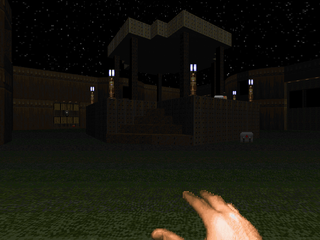 It's a massive courtyard with a stunning central platform and monsters firing down on you from all surrounding sides. Those exploring early with the blue key will find that they've handily cleaned out most of the opposition, leaving only a few mancubuses left, who don't pose much of a challenge. It seems like a missed opportunity; I was hoping for some kind of nasty trap, like an arch-vile emerging in the battlements. This all dumps you in the sewers proper, elegantly constructed and with some bang-on lighting. Both sides lead into the exit room, a toxic cistern with a bit of a surprise, though it's nothing you can't handle (but it may be a bit bothersome to contain). I'd say the overall level of detail and lighting is great, keeping the map looking fresh even though most of it takes place in the browner portions of Anderson's imagination. It's nice to play a larger map given that everything else I've played from the Master Levels is a bit in the smaller category and less challenging in comparison. It's still pretty easy, but like Virgil's Lead, some of these traps (like the sudden lowering floor) are great surprises and keep you guessing throughout the level. 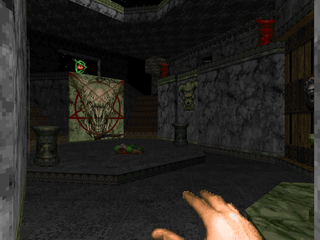 Minos' Judgement is a fun map from the Master Levels for Doom II. It's a fair bit larger than about half of the project and a bit more challenging to boot. It's also a good showcase of Anderson's talents as a mapper, with an excellent layout, architecture, detailing and lighting. It's no wonder everyone praises Dr. Sleep as one of the greatest mappers of Doom's early years. In the general scheme of the Inferno series, it's a bit bigger than previous installments, and a bit more action-packed, featuring everything but the arachnotron and the big bads. You really should play this if you haven't already. It's probably the best of Sleep's Master Levels for size, combat, and aesthetics.